The Sand Pro 75D is an ultra-quiet, energy-saving sand filter system that will clean your above ground pool 10 times faster than an equivalent size cartridge filter, with much less maintenance. This system’s new design features an increased flow rate of greater than 20% vs. other similar filters, resulting in cleaner pool water at a pace that is unrivaled in the market, while still maintaining a low electrical usage cost with the 3/4 HP Pump. This system also boasts a full 1-yr warranty and comes complete with a hair & lint trap, and a compact filter tank for easy mobility. 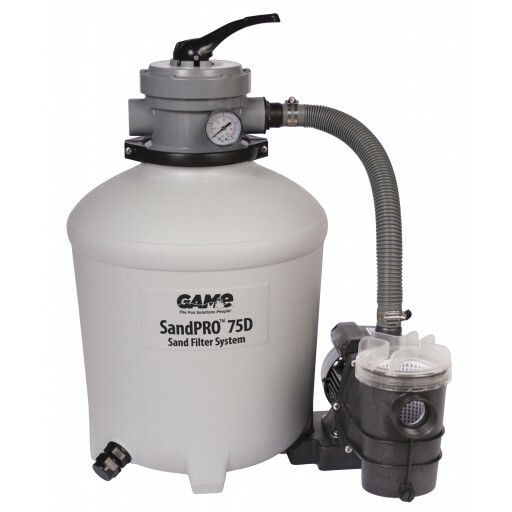 Eliminate the costly cartridge replacement filters to save money and time for years to come with the Sand Pro 75D 3/4 HP Pump and Sand Filter.